The advent of simple and affordable tools for molecular identification of novel insect invaders and assessment of population diversity has changed the face of invasion biology in recent years. The widespread application of these tools has brought with it an emerging understanding that patterns in biogeography, introduction history and subsequent movement and spread of many invasive alien insects are far more complex than previously thought. We reviewed the literature and found that for a number of invasive insects, there is strong and growing evidence that multiple introductions, complex global movement, and population admixture in the invaded range are commonplace. Additionally, historical paradigms related to species and strain identities and origins of common invaders are in many cases being challenged. This has major consequences for our understanding of basic biology and ecology of invasive insects and impacts quarantine, management and biocontrol programs. In addition, we found that founder effects rarely limit fitness in invasive insects and may benefit populations (by purging harmful alleles or increasing additive genetic variance). Also, while phenotypic plasticity appears important post-establishment, genetic diversity in invasive insects is often higher than expected and increases over time via multiple introductions. Further, connectivity among disjunct regions of global invasive ranges is generally far higher than expected and is often asymmetric, with some populations contributing disproportionately to global spread. We argue that the role of connectivity in driving the ecology and evolution of introduced species with multiple invasive ranges has been historically underestimated and that such species are often best understood in a global context. The online version of this article (doi: 10.1007/s10530-016-1082-9) contains supplementary material, which is available to authorized users. The Tree Protection Cooperative Programme (TPCP), the National Research Foundation (NRF) and the Department of Trade and Industry (DTI) of South Africa are acknowledged for their financial support. 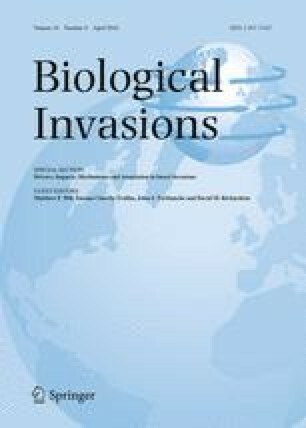 This paper had its origin at a workshop on “Drivers, impacts, mechanisms and adaptation in insect invasions” hosted by the DST-NRF Centre of Excellence for Invasion Biology in Stellenbosch, South Africa, in November 2014. Additional financial support was provided by HortGro, the National Research Foundation of South Africa, Stellenbosch University, and SubTrop.